Academics love to quote—as evidence, as embellishment, as filler. Snippets and long blocks. Quotations within quotations. It’s a pity that so many do it so poorly. Here is Part 1 of some advice from a copy editor experienced in tidying up quotations. —On accuracy. Long quotations in the manuscripts I read seem more error-free than in years past, which I attribute to easy cutting and pasting from online sources (as opposed to inexpert typing). Unfortunately, easy pasting also increases the rate at which published typos are replicated. So read what you paste, and if anything looks amiss, investigate further. —On syntax. Some writers have a tin ear when it comes to sliding a quotation nicely into a sentence. It’s OK to borrow a word or two from the quotation in order to avoid chopping “it into a quoted phrase” of ugliness. As long as the actual quotation is accurate, no one will accuse you of plagiarism if instead you finesse it into a “quoted phrase” that’s more lovely. ­­—On capitalization. Changing the case of the first word of a quotation to jibe with its surroundings is a well-accepted convention that is not always understood or observed by writers. I’ll discuss how to do this in more detail in Part 2. —On ellipses. Leaving material out of a quotation requires those three little dots … and causes endless confusion for quoters. The Chicago Manual of Style has good advice in Chapter 13 (which I will expand on in Part 3). But here’s one tip: Ellipses are rarely needed at the beginning or end of a quotation. Readers understand that a quotation is taken from a larger text, so save your dots for material that’s missing from the middle and for quotations that end midsentence. —On sources. The source is not part of the quotation, but it is usually treated as part of the containing sentence: “The borrowings of good writers are never thus superfluous” (Walter Raleigh, Style, 117). Thus the source follows the ending quotation mark, and the sentence ends after the source. When you set off a long quotation as a block, however, there are no quotation marks. So put the source after the end of the last sentence, lest it be taken as part of the quote. By convention, the source itself has no ending punctuation. —On sic. Sic is properly used (1) when you must reproduce a suspicious or incorrect original exactly and wish to make it clear that you have not introduced the problem yourself in typing, or (2) when the error is relevant to the discussion. Use sic humanely. If the original contains a typo of no consequence, it is polite—and justifiable—to correct it quietly. In Part 2, I’ll write about when it’s OK, and not OK, to change something in a quotation. Quotations from Walter Raleigh are from his Style, 3rd ed. (London: Edward Arnold, 1898). Originally published as “Quoting Well, Part 1: Its More Than Just Accuracy,” at Lingua Franca, November 30, 2011. My guest today is Amy Einsohn, author of The Copyeditor’s Handbook, a book long beloved* by writers and editors and just recently appearing in its third edition. Many of you will have worn out your first or second editions by now, so let me recommend the new one, which Amy has updated not only in matters of editing technology, but also to take account of (ahem) the 16th edition of The Chicago Manual of Style and other resources. A professional editor herself, with experience across the board in trade, scholarly, and corporate editing, Amy also teaches copyediting classes and workshops. Carol: Amy, thank you so much for agreeing to blog with me here! I’ve been looking at the new edition, and here’s something I’m curious about: In The Copyeditor’s Handbook you are known and loved for your flexible and humane approach to “the rules.” Were you always of this mindset even as a child, or were you naturally bossy but somehow evolved? Amy: I didn’t have siblings or pets at home, and I was always the smallest and youngest kid in my class at school. So I didn’t have the opportunity to test out any innate bossiness. I entered adolescence during the sixties, and questioning “the rules” was the theme of the decade. By the time I was working at my first serious job—teaching freshman composition at UC Berkeley—I had figured out that my strengths as an instructor were my enthusiasm, humor, informality, and open-mindedness. Years later, when I was teaching in the UC Extension copyediting program, I had read enough to understand the value of distinguishing real rules from conventions, shibboleths, preferences, fetishes, and peeves. Carol: (Aha. I just learned the value of being a middle child: it’s where I found my innate bossiness.) In your last sentence, I hear you alluding to the ongoing battle between descriptivism and prescriptivism. More recently, I’m seeing online a growing backlash against what Eugene Volokh calls “assertionism,” which is (briefly put) prescriptivism without literary or historical evidence to support one’s assertions. But it sounds as though this is nothing new for you. Do you get any grief from readers or students for not promoting rules more strictly? Amy: Some students are disappointed; many are relieved. The disappointed ones had hoped that I would arm them with new, more obscure shibboleths to enforce. I often meet students who cling to unfounded precepts that they learned in high school, and they become uneasy when I offer three possible explanations: (1) they have misremembered what their teacher said, (2) their teacher was a well-meaning oversimplifier, or (3) their teacher was a Miss Thistlebottom—Theodore Bernstein’s name for the pedant who proclaims her antique preferences to be immutable rules. I send students off to Merriam-Webster’s Dictionary of English Usage, to read about the history of a contested usage, examine a range of expert opinions, and look at examples by well-known writers. Or I bring in entries from the major style manuals to illustrate that what a student thought was a rule is actually an editorial convention, a matter of house style. My perennial advice to copyeditors is: If you don’t care for construction X, don’t use it in your writing, but copyeditors aren’t hired to impose their own taboos and taste on authors. Carol: I agree. But I sometimes find that writers actually follow the fake rules they were taught about not splitting infinitives or beginning sentences with conjunctions. And that’s fine. I try not to meddle unless there’s a problem. I have to say, though, it’s pretty rare for a writer to object if I end up having to raise an issue like that. It shouldn’t surprise me. Academics—and writers, for that matter—tend to be creative and curious and to think of themselves as lifelong learners. Maybe you’ve found as I have, in fact, that more experienced writers are more open to editing? Carol: Hmm. Probably near the heretics. But one reason writers fear copyeditors is that they’ve had bad experiences with them. I’ll admit there have been times when I was defensive and inflexible about my editing. Sometimes a writer just pushes a button! And once my competence is questioned, it’s very hard not to push back. But I don’t suppose you have any experience with that . . .
Amy: I now regret how I treated several of my early victims (read: authors). Then I realized that pushing back only made things worse—for me and my prospects as a freelancer as well as for the publisher’s staff. Instead, I took the approach that my editing represented my best professional judgment, which the author had the prerogative to accept or reject. During the cleanup pass, I complied with the author’s changes and stets unless I felt they might prove embarrassing for the author or might damage the publisher’s reputation. For example, I did push back when a pair of coauthors quoted a homophobic pun—a newspaper lead from the 1930s about a murder—calling it one of the best-known leads of that era. I asked the authors to supply a substitute, saying that it was inadvisable (tactful me!) to present an offensive sentence as exemplary. They thought the pun was witty and ignored my request. I didn’t bother re-posing my query. I took the passage to the managing editor, who relayed my concerns “upstairs.” Someone up there prevailed, and the sentence did not appear in the published volume. Carol: Ah, yes—we have an “upstairs,” too. 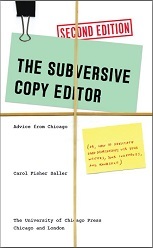 (It’s interesting how publishers always seem to put the copy editors “downstairs.”) I must say it’s comforting to hear that you too were once a new editor who made mistakes but learned from them. Amy: And today I’m an experienced editor who still makes mistakes and is still trying to learn from them. Carol: I’ll let you go now, but with one last question I can’t resist asking: I notice that on your book page the marketers at the University of California Press have chosen to list Write Your Own Egyptian Hieroglyphics among the “related titles.” That’s an unusual pairing. Amy: I guess the tie-in is that my book and hieroglyphics are in the “language and writing” category of the press’s list. I don’t think they’re part of a new “career opportunities” series. Thank you, Carol, for letting me ramble on. Carol: Amy, thank you! You’re a good sport. This has been a wonderful opportunity for fans (like me) to learn a little about you personally. Having a number of deadlines last week, I resorted to my emergency ploy of watching more television. As always, it was revelatory. This time I was struck by screenwriters’ never-ending resort to the ancient and lame “Look over there!” strategy to extricate heroes and villains from tight spots. A diversion can be simple and improvised on the spot, as in Alias, when Jennifer Garner confuses the bad guy by causing her phone to ring a few yards from where she’s standing. Or it can involve meticulous planning, like the split-second assassination on a crowded sidewalk in the new movie The Double. In any case, such tactics remind me of how writers often end up doing the same kind of thing, no doubt without any planning at all: They distract their readers, pulling them out of the prose and sometimes even diverting them off the page. Referring to a person without introduction. If it’s Shakespeare, fine. If it’s someone obscure whom your readers know well, fine—you don’t want to patronize by explaining the obvious. But if you have any interest in bringing along the uninitiated, then include a first name and a short gloss, especially if the surname is a common one: Victorian novelist Wilkie Collins. You’ll save your readers a side trip toWikipedia. Overusing “scare” quotes. Some writers love too much these little “noodges” and “eyewinks” that say “you and I know what I really mean.” The trouble is, not all readers will know what you’re getting at. They might rally themselves to look up the quoted terms elsewhere, or they might just tire of all the eyebrow wiggling and wonder whether you have anything definitive to say. Better to just say what you mean. Switching tenses midstream. This will guarantee that readers turn back to begin again. It happens frequently in academic prose when the historical present comes into play: “Obama says” versus “Obama said.” The present tense is helpful when paraphrasing or summarizing or suggesting that a person was or is in the habit of saying something: Heraclitus writes that we never step into the same river twice. Chicago’s Mayor Rahm Emanuel says SUV’s cause more damage to roads than lighter vehicles do. The past tense more strongly implies that a person actually said something, verbatim, at a given time: Emanuel said, “That’s where the damage is caused—in heavier vehicles.” Heraclitus wrote, “Potamoisi toisin autoisin embainousin, hetera kai hetera hudata epirrei.” Varying the treatment can work well enough, but flip-flopping within a paragraph or even a sentence is inelegant at best, misleading at worst, and distracting always. Adding too many hotlinks. Even if the main purpose of your text is self-promotion and your links are to your own works, the primary goal is for readers to reach the end of this work. Sending readers on a wild goose chase with commands to “see above” and “see below.” Confident writers trust readers to (a) remember what they’ve read and (b) wait for an argument to unfold. They know that tables of contents and indexes are available as guides to longer works. If you need to create a cover for a passing hit man, these ruses probably won’t do it. But they might just shake a reader off your tail. Chase bank is bullying me. The other day I received a threatening letter informing me that unless I notify them by December 15, they will begin mailing me “offers” for their products and services in nine (9!) categories, including auto financing (I don’t have a car), education (done that), mortgage (I’m set), and a raft of others. From Googling the return envelope’s address, I’m convinced the letter is authentic. Kurt Schick’s recent article about what he perceives as overattention to citation formats in the teaching of undergraduates drew passionate replies on every side of the issue (along with the usual number not really having much to do with the issue).